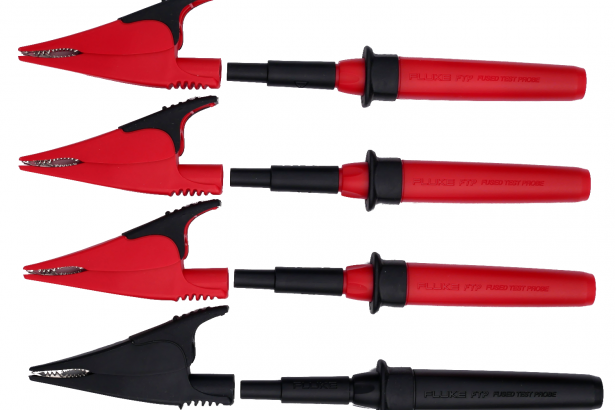 The Fluke FTP17XXPQ test lead set consists of three red probes with alligator clips and one black probe with alligator clip. The tips of the probes have a screw on connector with 4mm plug suitable for attaching the alligator clips, the other end of the probes have 4mm sockets suitable for connecting test leads. The unique design of the probes means that if the fuse has blown a voltage is still displayed by the measurement equipment. This offers an extra level of user security, with some fused probes voltage may not appear to be present if the fuse is blown. The FTP17XX has a high impedance path so a voltage is always displayed. The voltage displayed by measurement equipment will be less than the nominal indicating safely to the user about the presence of a voltage but with a test lead problem.